You may have noticed that I haven't been around quite as much lately, which has mostly been due to the fact that I have been lying in bed most days trying to keep my lunch down and my energy up - neither of which are easy when you're EXPECTING!! Yup! We are expecting our 4th child and we are absolutely delighted! While this has put a little bit of a stop to the blogging for a while, I now feel on an upward curve and am back to feeling somewhat human again as I approach the 3.5 month mark! To celebrate this wonderful new addition to our family, I thought it might be nice to bring to you something relevant and fun that I KNOW all of you expecting parents or grandparents are going to adore, which will make a fabulous gift for the Daddy of the family direct to you from DADDY SCRUBS!! Daddy Scrubs is a fabulous site that allows you to buy the perfect gift for the enthusiastic new dad and allow him to tell the world of his impending fatherhood and to get involved!! 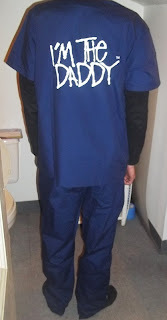 I recently received one of the Daddy Swag boxes from Daddy Scrubs, which came with a mug, hat, sunglasses, pens, stickers, a t-shirt and, of course, a scrub!! All items arrived boxed in a huge gift box ready to hand over to the expectant dad so that he might inform the world!! The scrubs are of fabulous quality and bring dad into the fun and excitement of the moment when he slips these on! 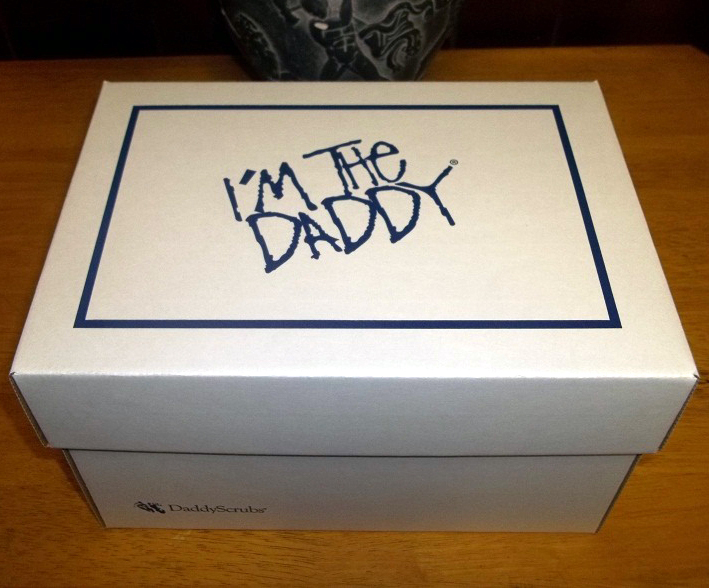 He'll look trendy and ready to welcome his new bundle into the world, while quietly announcing "I'm the daddy!". The mug, hat, glasses and pens are practical and subtle little ways to showcase his new embryo and to let the world know that he is embracing the every moment as a proud new father to be!! There are stickers for the back of his car, too! So there really is no corner of the world he can't shout it out to!! He's the man!! At just $89.95, this particular gift box is of fabulous value and sure to delight! Scrubs alone, if you would prefer to buy separately, will cost $54.95 and so you're really getting a lot of little extras for the money you'll spend and it is well worth it for this occasion, which really doesn't come around too often! 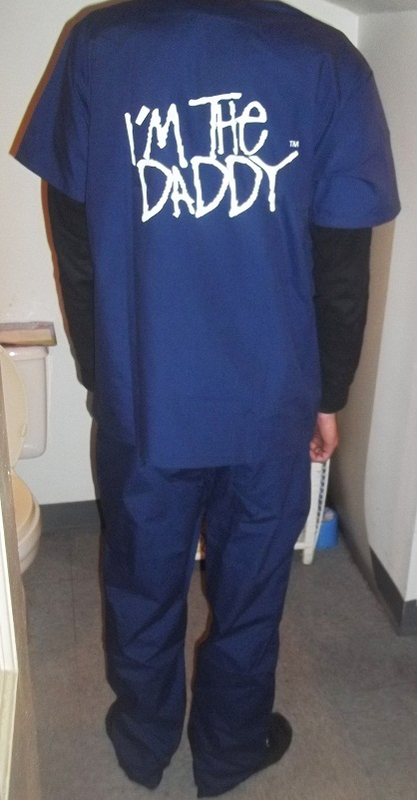 Daddy Scrubs come in several colors from Edgy Navy to Simple Green and run from a size S to 5XL! There really is something out here for just about everyone! WIN A SCRUB OF YOUR OWN!! As luck, and kindness would have it though, the fabulous people over at Daddy Scrubs would like to offer one of you lucky readers the chance to WIN one of these scrubs all for your own to give to the man in your life who is about to become a father! To be in with a chance of winning, all you have to do is to enter via the rafflecopter below!! All entries are voluntary and you may do as many or as few as you wish! Giveaway ends 4/12/13 and winner will be contacted within 24 hours of giveaway end and have 48 hours to respond to their prize email before being redrawn! 18 yrs or older to enter, please and reside in the U.S - thank you! Daddy Scrubs is responsible for the fulfillment of this prize! That's it! It is really simple to enter! If you have any questions or comments about the giveaway, please email me using my contact form, above, and speak your mind! What are you waiting for!? Get entering! GOOD LUCK!! Disclaimer: I was provided with a gift box for the sake of this review but this has not influenced my opinion, which is always honet and 100% my own - your views may differ from my own, thank you! Got this for my hubs and a mug :) He loves both! I would love this for a colleague expecting a baby! I'll give this to a friend who's expecting! It would make a great gift! For my husband! I am 33 and half weeks along right now. I'd love to win this and surprise him with it! my hubby the father to be! What a neat idea! Would have been great to have something like this for the other kids! My husband. I'm pregnant with our first.